Dayton’s Five Rivers MetroParks is an expansive park system offering nearly 16,000 acres of green space in 25 facilities. Getting back to nature has never been so easy with all the Dayton parks just a short distance from the city — and many accessible by bicycle. 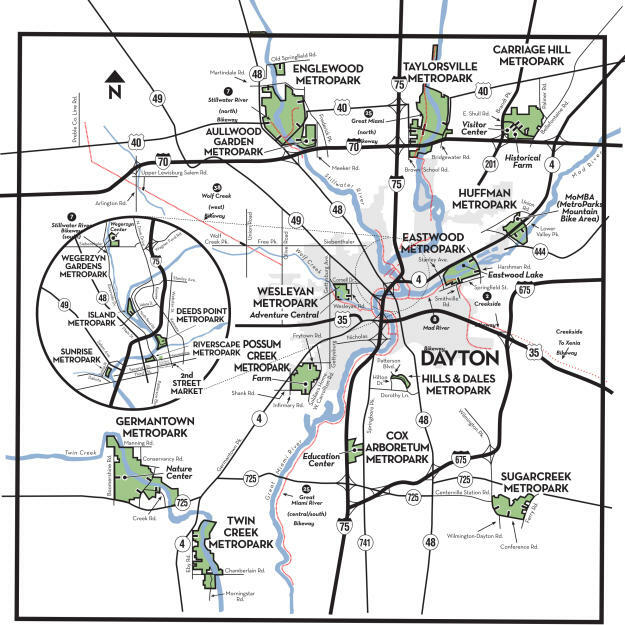 Dayton is a bronze-level Bicycle Friendly Community, which — among other things — means every Daytonian lives less than 10 minutes from a bike path. Many locations also offer programming for everything from outdoor recreation to bird watching to photography or children’s activities. A number of these are free and don’t require registration. Dayton parks are some of the best places to discover the great outdoors. For more information on Five Rivers MetroParks, call 937-275-PARKS or visit their website. One of the Miami Valley’s most historic garden parks, the award-winning Aullwood Garden Metropark encompasses 31 acres of picturesque prairie, old-growth forest with centuries-old trees and a fragrant Lilac Lawn. Located at the former home of conservationists John and Marie Aull. At the Carriage Hill Metropark, visitors can experience Carriage Hill’s historical farm which includes a barn, blacksmith shop, farm animals and period actors who demonstrate 1800s life. Camping, fishing, horseback riding, and cross-country skiing are commonplace pursuits among the 900-acre park’s many trails. The beautiful 189-acre Cox Arboretum Metropark includes hiking trails through forests and meadows, ponds and the Zorniger Education Center. Families will delight in the native Butterfly House, open during summer. Unique specialty gardens feature a rock garden; lush, colorful perennial gardens and an edible landscape garden. Enjoy this surprising, refreshing oasis right off I-75. At the convergence of the Great Miami and Mad Rivers, this scenic point provides inspiring views of downtown Dayton and the Five Rivers Fountain of Lights. The small Deeds Point Metropark offers opportunities for bird watching along the Great Miami River Bikeway. Eastwood’s 185-acre lake and access to the Mad River provides an ample setting for a variety of water sports, while on-land features include biking and hiking trails, picnic shelters and a playground. 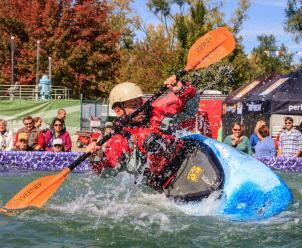 The Midwest Outdoor Experience, formerly known as GearFest, is hosted at Eastwood MetroPark each year. An 18-hole disc golf course, the Stillwater River, three waterfalls and 12 miles of scenic trails are just some of the wonderful features found at Englewood MetroPark, one of the city’s largest. Add’l. entrances at 7101 Conservancy Rd., and 7481 Creek Rd. The Germantown MetroPark provides an abundant habitat for native species that earned it designations as an official Watchable Wildlife Viewing Site and Important Birding Area. Features include elevated boardwalks, meadows, a ravine, an underground Nature Center and a 22-mile path with tent camping sites – the Twin Valley Trail – that leads to Twin Creek MetroPark. Designed by famed landscape architects the Olmstead Brothers, who also designed Central Park and the Washington, D.C. Mall, the restored urban Hills & Dales MetroPark and natural refuge dating back to 1907 features hills, woods and wetlands plus Adirondack-style shelters, a boardwalk, picnic areas and play areas for children. Named for the historic Huffman Dam, this MetroPark is conveniently connected to the Kauffman Road Bikeway and offers more than eight miles of sustainable mountain bike trails developed to International Mountain Bike Association standards. Huffman Metropark is home to the MetroParks Mountain Biking Area, MoMBA — and expert and beginner cyclists alike will find fun and challenge on this course. Visitors also enjoy Huffman Lake, the Mad River, miles of hiking trails, picnicking and fishing. The beautifully restored, downtown Island Metropark is located at the convergence of the Great Miami and Stillwater Rivers. Catch a concert in the celebrated bandshell or fish, spot beavers and soft-shell turtles from the riverbanks, all under the shade of stately sycamore and maple trees. A special water play area is open until 8 p.m. in the summer. The unique Possum Creek MetroPark consists largely of old farmland that’s in the process of natural succession. Goats, pigs and other barnyard animals still roam the fields, and remnants of a 1925-1945 amusement park – Argonne Forest – can be seen on the premises. Whether fishing, hiking the Farm Trail, horseback riding or enjoying Polly Possum’s play area, families can enjoy a day full of fun. 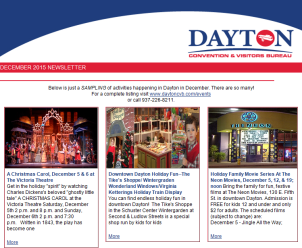 The multi-seasonal, multi-use Riverscape MetroPark is among Dayton’s most popular venues and hosts major festivals such as the Dayton Celtic Festival. Features include kayak and bicycle rentals, a bike hub including showers and restrooms, an ice rink, gardens, reflecting pools, concessions, a plaza, a fountain and splash pad, the Five Rivers Fountain of Lights, plus the Dayton Inventors River Walk, which spotlights several local inventors and their inventions ranging from the cash register to the airplane. Indulge in the picture-perfect landscape of Sugarcreek MetroPark, strewn with wildflowers and native plant species. The diverse habitats in this 618-acre park transport visitors from dense woods to tall grass prairies to babbling brooks. Walk through the Osage Orange Tunnel and discover magnificent 550-year-old White Oak trees. 50 Edwin C. Moses Blvd. Watch the sun rise or set at the small Sunrise MetroPark, perched on a high bank of the Great Miami River. 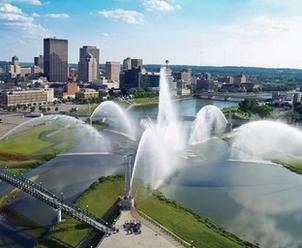 Enjoy the impressive Dayton skyline, fish for bluegill and carp, or just relax. The 2,384-acre Sycamore State Park is nestled among rustic farmlands west of Dayton. With multiple hiking and horseback trails, ponds for canoeing and fishing, and overnight camping available, Sycamore State Park provides fun for the entire family. Hunting is permitted with a valid Ohio hunting license in designated areas in hunting season. Taylorsville MetroPark provides a mix of nature and history where you can see remnants of the Miami-Erie Canal, the site of the abandoned town of Tadmor or a rock out-cropping from a major rock fall. Taylorsville is open year-round, and offers sledding and cross-country skiing in winter. Located just 20 minutes from Dayton, Twin Creek MetroPark is one of the system’s most pristine natural areas. This park features a pond, meadows and woodlands, abundant wildlife and more than 520 species of plants and 70 species of nesting birds. Equestrian, walking and backpacking trails run throughout its 1,000 acres. Twin Creek also boasts earthen walls of the Hopewell people’s 2,000-year-old Carlisle Fort. Gardeners will find inspiration in the meticulously landscaped Wegerzyn Gardens MetroPark. Ten formal gardens including the Federal, Memory and Victorian gardens sprout from the property along with six and a half-acres of garden space, where Dayton residents plant and tend vegetables, herbs and flowers every season. The Wegerzyn Gardens MetroPark has miles of recreation trails for hiking, biking or cross-country skiing and wooded pathways for strolling. The Children’s Discovery Garden is an interactive and educational place for youngsters. Adults can learn by visiting the gardener’s page at www.metroparks.org to see what’s in bloom at Aullwood, Cox and Wegerzyn MetroParks. This 55-acre haven provides a getaway without leaving the Dayton city limits. Situated on the banks of Wolf Creek, Wesleyan MetroPark contains mature woodlands and floodplain forests. Adventure Central, an education center formed by an interactive partnership with the Ohio State University Extension, teaches urban youth about the environment through hands-on learning. Special programming is offered throughout the year for kids and adults, from job skills training to overnight camps.